Our unique international bachelors degree prepares you for success in the global workforce by bringing international perspectives and experiences to your university degree. 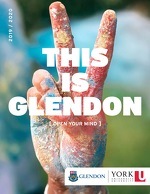 Glendon’s reputation for excellence in languages and academics, our close-knit diverse community, and our Toronto location make us the ideal host for bilingual and trilingual programs. International Bachelor of Arts (iBA) and International Bachelor of Science (iBSc) degrees follow the same structure as the BA and BSc, but fold in additional language courses, internationally-oriented courses, and an international exchange (typically completed in your third year). Exploration of international issues within and beyond your major(s) in internationally-oriented courses. Practical experience living and learning abroad on an international exchange with a partner university. Bilingual certification for the Bilingual iBA & iBSc programs, and opportunities for trilingual certification with the Trilingual iBA & iBSc program options. Glendon’s international bachelor degrees recognize the need to prepare students for an exciting and complex international environment where issues increasingly transcend national borders. Through reflection on international issues within and beyond your area of specialization, studying abroad, and developing advanced-level language skills, you will enrich your life permanently and distinguish yourself in the workforce or when applying for graduate studies. The iBA and iBSc have the same basic degree requirements as the corresponding BA or BSc : when you apply, you choose your major from from one of our program options. Once you become a Glendon student, you will meet with an academic advisor who will walk you through all requirements and show you how to enroll in your courses. Over the course of your degree, you will take either two full-year courses or four half-year courses from a list of over 200 courses. These courses will explore key international issues, either within or outside your area(s) of specialization. All iBA/iBSc students will spend either one academic semester (roughly four months) or one full academic year (roughly eight months) living and studying abroad with one of our partner universities. Students normally go on this exchange during their third year. Glendon students have the advantage of being eligible for two exchange programs: one with 17 exchange options reserved exclusively for Glendon students, and another with over 100 additional available exchanges through York International. Our international degrees reinforce Glendon’s commitment to arming students with language skills and recognize the vital role that languages play in living and working internationally. The iBA or iBSc is available as a bilingual program for students seeking to attain a high level of proficiency in English and French, or as a trilingual program for students seeking proficiency in English, French, and a third language. In both the bilingual and trilingual programs, students graduate with formal language certification that is respected and sought after in the workplace. While all Glendon students will achieve a minimum level of bilingualism (English, French) by graduation, students in the Bilingual iBA or iBSc will achieve the Certificate of Bilingualism – a more advanced language certification than the minimum required for graduation. While all Glendon students will achieve a minimum level of bilingualism (English, French) to graduate, students in the Trilingual iBA or iBSc will achieve, at minimum, the Certificate of Bilingualism – a more advanced language certification than the minimum required for graduation. You will also reach a senior level in a third language. In addition to the courses in English and French, you will complete 3 full courses in Spanish (offered at Glendon) or 3 full courses in another modern language offered at York’s Keele Campus, where you’ll find the widest selections of language options of any Canadian university. The bilingual iBA & iBSc are direct-entry programs and have the same admission requirements, general application procedures, and deadlines as the corresponding BA & BSc programs. When applying to the iBA or iBSc bilingual, please choose the corresponding OUAC code for that program. If you’re not sure which program you will ultimately major in, simply specify the one that interests you most at the time of application. You can change your major when you come for your advising appointment, or during or at the end of your first year. Likewise, if you begin in a BA or BSc program and wish to switch to an international degree in second year, you may do so provided you have maintained the required academic average. You may switch from an international degree to a BSc or BA during your studies if you wish. These changes are possible for all programs with the exception of Education, Translation, and Mathematics, which have additional application requirements and/or fixed entry points. While there is no minimum level of French required to enter the bilingual iBA or iBSc, the degree is ideally suited to students who have some background in French – either some core French, French immersion, or some other exposure to French. This is to provide students with a solid foundation for reaching the more advanced level proficiency required for the degree. The trilingual degree is a delayed-entry program requiring one year of university studies prior to entry. This is intended to provide you with a year to determine whether you are comfortable enough in English and French to incorporate a third language in your studies. This degree has been designed for students who have some background in French – either some core French, French immersion, etc. Students are not required to have any background in the third language; beginners are welcome. If you are applying to first year at Glendon and are interested in the trilingual degree option, we recommend that you apply to the bilingual iBA or iBSc. You will be switched into the trilingual program once you have determined, with the help of an academic advisor, that you have the appropriate level of English and French to pursue the trilingual program. If you are applying to transfer into Glendon in second year or higher (you have completed one year of university studies or the equivalent), please choose code YGH for trilingual iBA or YYM for trilingual iBSc and specify your program of choice (e.g. international studies, history, etc.). It is strongly recommended that you have some background in French before considering the trilingual program.